This is one of my favorite posts. It has been criticized for being a too-modern interpretation of an ancient tale. The tale itself is merely a retelling and paraphrase from a translation of Ovid; so that is as it is. And yes, my interpretation is indeed modern. But reinterpretation is itself part of our Pagan heritage. Look at how philosophers reinterpreted ancient myths so they were relevant to their own thought. In Egypt, scribes made notes in the margins of older written texts, explaining the ancient symbols and stories for their own age. Because that is the power of the tale, the power of myth, the power of story. The core of it remains the same, but when we look at it with our modern eyes and take it into our modern hearts, we discover our own interpretations, enabling ancient myth to live for us today. In the Phaestos region of Crete, lived a couple named Ligdus and Telethusa. Telethusa was pregnant and near to her time. 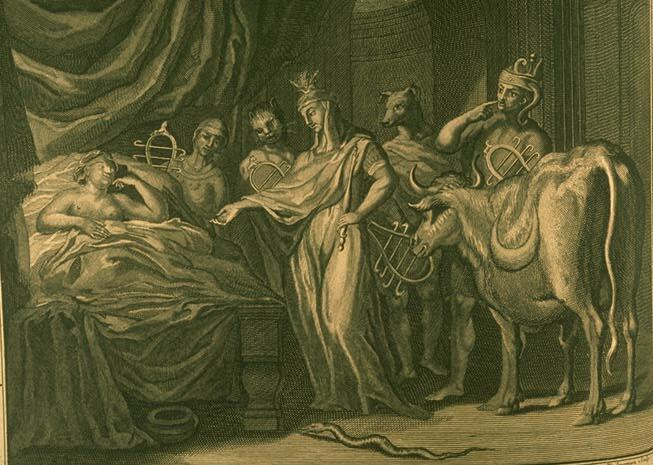 As the birth of their child approached, Ligdus told Telethusa that he wished for her two things: first, that the birth cause her no pain, and second, that the child be a boy. For if the child wasn’t a boy, he commanded Telethusa to put her to death. (Girls were too much trouble and weak, you see.) Then they both wept. The child, of course, was a girl. Obeying the Goddess, Telethusa kept the baby and raised her as a boy. Her father even named her after his grandfather, Iphis. As Iphis was a name appropriate for either boy or girl, the mother secretly rejoiced. As Iphis grew, her features were such that she would have been considered beautiful whether a boy or a girl. Iphis wept, railed, and lamented her love for another girl. Iphis does not understand. She calls her passion monstrous and extreme and wants to wish it away—sort of. But eventually, Iphis pulls herself together and gives herself a good talking to. After all, she has almost everything she wants. Both her parents and Ianthe’s are happy with the match, Ianthe herself is happy with the match, and certainly Iphis is happy with the match (though she is afraid of the revelation of the wedding night). So she stops complaining and prays for the wedding to come. Her mother Telethusa, on the other hand, feared what would happen when the two girls were wed. So she kept putting off the ceremony with a whole series of excuses. Yet finally, the wedding could be delayed no more. In desperation, Telethusa takes Iphis to the Temple of Isis. She throws herself upon the Goddess altar, crying and praying to Isis for help—for, after all, it was by the word of the Goddess Herself that Iphis lives! Suddenly, the altar of the Goddess begins to shake. The temple doors tremble. The horns on the headdress of the statue of Isis shine like the moon and the rattling of sistra is heard throughout the temple. Heartened, mother and daughter take their leave of the Goddess. But as Telethusa turns to look at her daughter, she sees that Iphis now has a tanned, less ladylike, complexion, shorter hair, sharper features, and a longer, more masculine stride. Behold! Iphis is transformed into a boy. In gratitude to Isis, mother and now, son, place a votive tablet in Her temple. 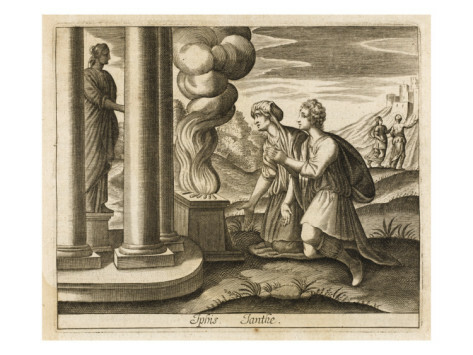 And the next day, Iphis and Ianthe wed…and, we presume, lived happily ever after. This story comes from a book called Metamorphoses in which Ovid tells the history of the world from Creation to Julius Caesar in a collection of myths about transformations of one kind or another. It was an immediate bestseller when first published and continues to exert influence and inspire art to this day. One of our best sources for over 250 classical myths, it was a major inspiration for Dante, Chaucer, Shakespeare, and Milton. The story illustrates a number of things about Our Goddess. First, it demonstrates Her soteriological function; Isis is well known as a Savior Goddess in the Roman period, and She saves Iphis and her mother in their time of need. The traditional Isian theme of dream visitation is part of the tale, too. In dream, Isis makes a promise to Telethusa, who “belongs to Her,” and She keeps the promise. Her saving nature, Her communication through dream, and Her ability to be there—in an immediate, even physical way—for Her devotees were all well-known aspects of the religion of classical Isis. But perhaps most importantly, the story shows the power of Isis’ magic. In this tale, as from the beginning, Isis is the Goddess of Magic. And transformation is specifically one of the things She does. In one of the tales in the Egyptian myth cycle known as the Contendings of Horus and Set, for example, Isis transforms Herself into a beautiful young maiden, an old woman, and Her sacred raptor, the kite (a form She takes quite often, as a matter of fact). In this case, She transforms a girl into a boy; and so Iphis becomes a transgendered Isiac. We cannot know for certain what Ovid meant to impart by this tale and I don’t want to read too much into it. Yet I feel quite comfortable putting a modern interpretation on it and understanding in it the love of Isis for Her transgendered devotees. Modern priestesses, priests, and devotees of Isis come in all sexual orientations. We all hear the voice of the Goddess. We all feel Her strong wings. We all taste Her magic. She lives in all our hearts. CreteEgyptian IsisGoddess IsisIantheIphisIsisIsis & genderLGBTIQModern mythMythMyths of IsisNeopaganPaganRoman IsisRoman mythTelethusaWho is Isis? Previous Previous post: Why Does Isis Have Wings? I always appreciate hearing old stories being retold to affirm trans people. We’ve always existed by some name or another – the fact that works about us are translated by transphobic, homophobic cishet men doesn’t make us less real, now or then. This seems an entirely reasonable interpretation to me!